What a weekend! Unfortunately, the Golden Eagles played horribly and lost 😦 but we still had a great time at the game. The half-time show was the best part; check out the Olate Dogs! The clip isn’t from the Marquette game, but it’s very similar to the show they put on for us. It was amazing!!! Even though Marquette lost, I’m a HUGE Chicago Bears fan and they beat the Ravens in overtime today, despite a 2 hour delay due to tornadoes and severe weather in Chicago! The cherry on top was that not only did we win, but both the Lions and Packers lost (sorry if you are a Lions or Packers fan)!! Wooo! Enough about sports. I have a recipe today that is inspired by one of my favorite restaurants in Milwaukee: Balzac. It’s a wonderful wine bar and restaurant on Brady Street that has wine on tap and a menu with appetizers and small plates. They have a great selection of wine, but the main reason I go at least twice a month is the food. Every single time I get the Margarita Pizza, which has chevre spread, fresh basil, sun-dried tomato, roma tomatoes, and mozzarella. It’s incredible! 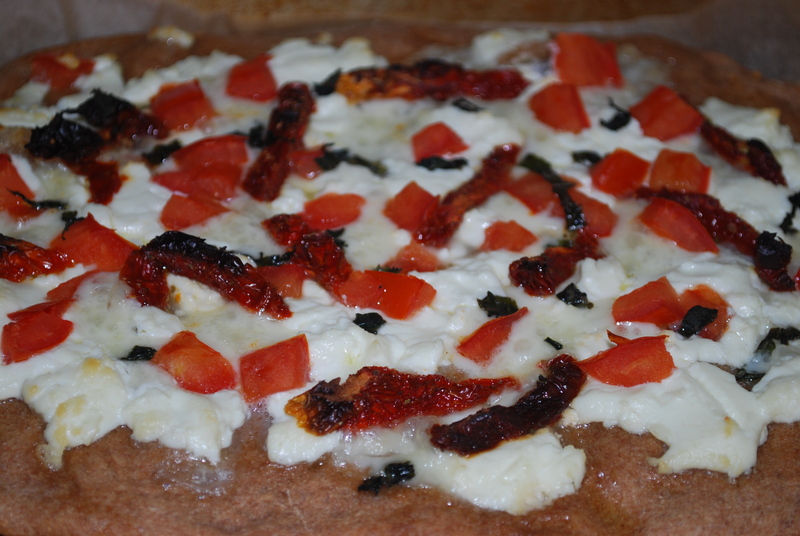 Tangy chevre, tart tomatoes, and a crispy thin crust make this pizza a masterpiece. I just knew I had to recreate it at home. 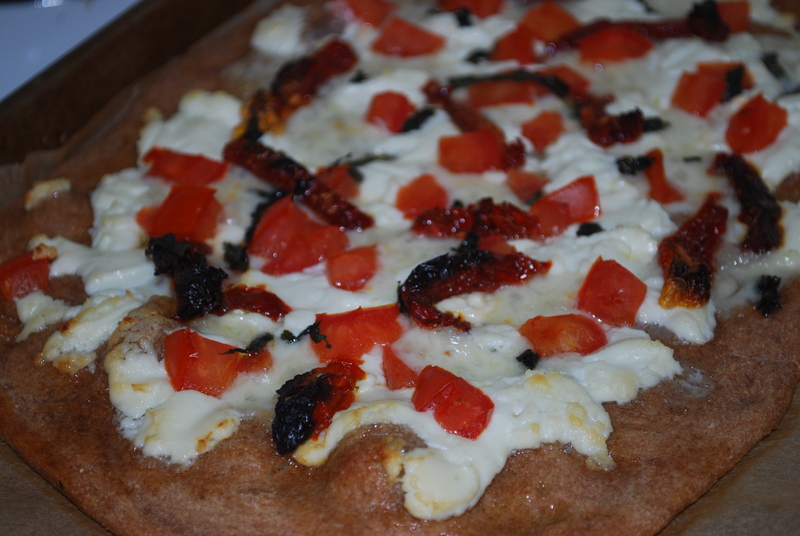 So here is my version of one of my favorite pizzas: Chevre and Sun-dried Tomato Margarita Pizza. First, preheat your oven to 350. Then start with the dough. I use Trader Joe’s 100% Whole Wheat Pre-made Pizza Dough. It’s delicious and really easy to use. It also freezes very well. I always buy a package of it, then separate it into halves and freeze each half for later use. 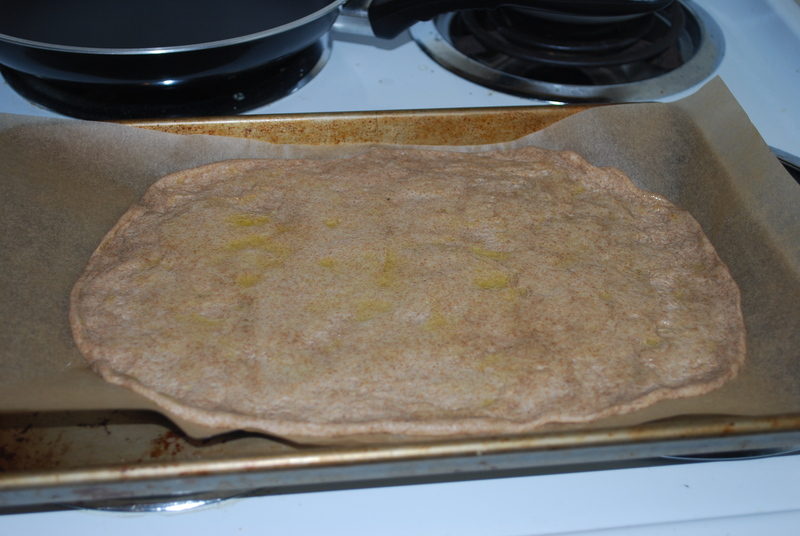 Lightly flour and roll out 1/2 pound (1/2 the package) of dough in a wax paper-lined baking sheet or pizza pan. This another area where I lack due to my twenty-something tiny apartment kitchen: I don’t have a rolling pin! So instead I just rolled out the dough with my hands and honestly it worked out just fine. The dough ended up nice and thin and crispy. Brush your dough with some extra virgin olive oil. 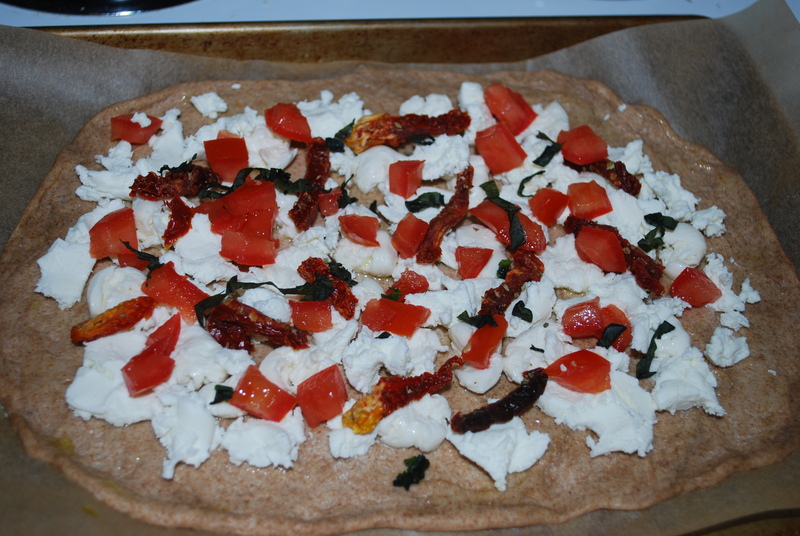 Now add the toppings: 2 ounces of chevre, 2 ounces of mozzarella (I used little mozzarella pearls since that’s what I had in my fridge), 1 handful of sun-dried tomatoes, 1 diced roma tomato, and 2 chiffonade basil leaves. Put your pizza in the oven and bake 10-12 minutes, or until the crust is golden-brown and the cheese is golden and bubbly. Let the pizza cool a bit, cut, then serve! 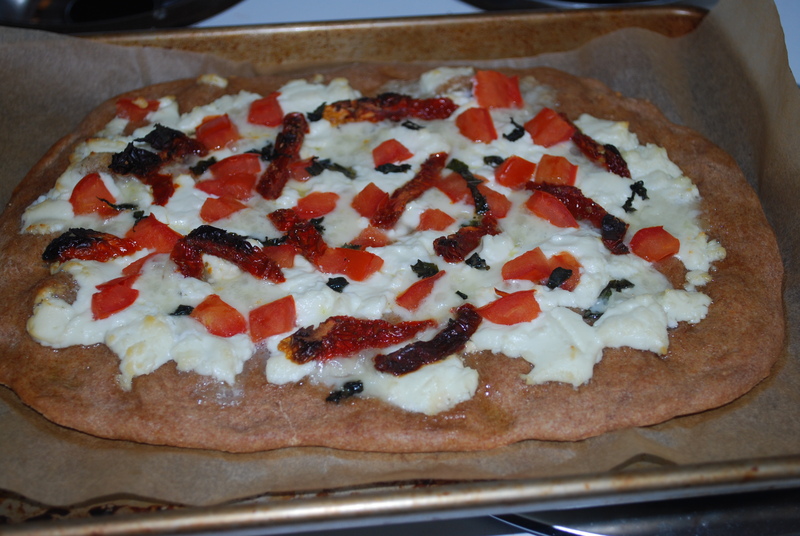 I LOVED this pizza – the crust was nice and crispy and all of the ingredients worked really well together! Preheat oven to 350 degrees F. Lightly flour and roll out dough in wax paper-lined baking sheet. Brush dough with olive oil. 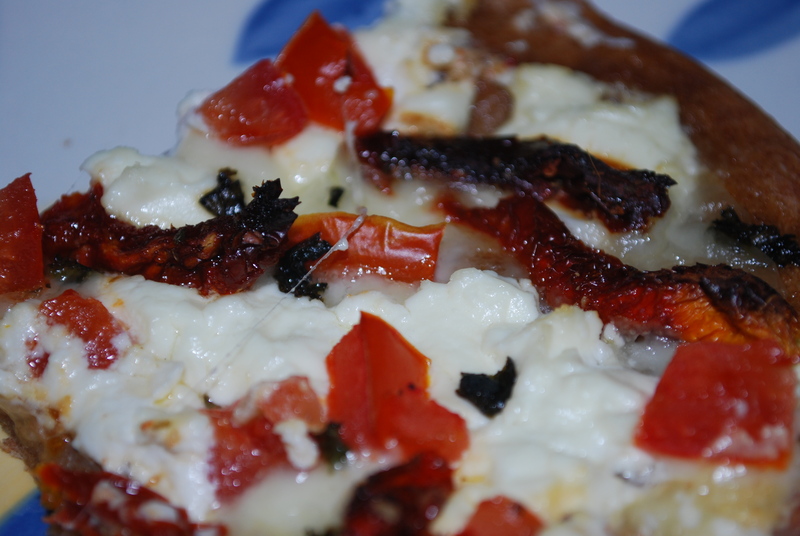 Top with chevre, mozzarella, sun-dried tomatoes, 1 diced roma tomato, and 2 chiffonaded basil leaves. Bake for 10-12 minutes or until the crust is golden-brown and the cheese is golden and bubbly. The addition of chevre and sundried tomatoes really brings this margarita pizza to the next level. 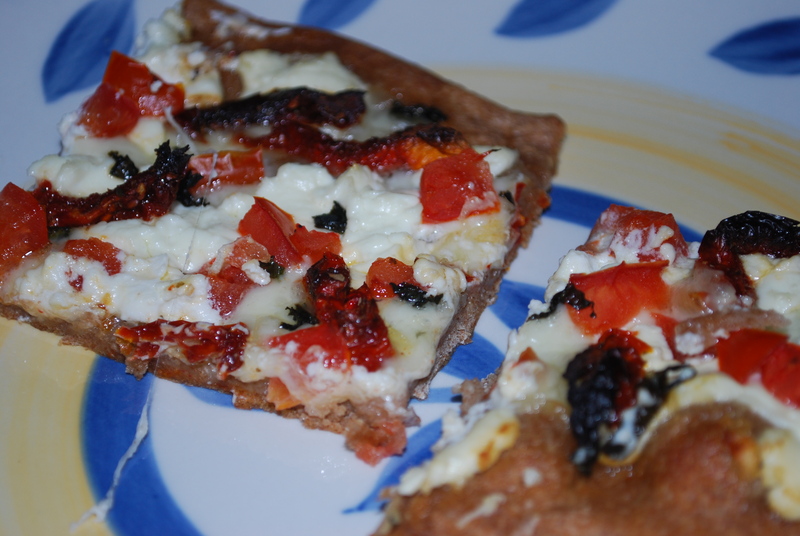 This entry was posted in Appetizers, Dinner, Uncategorized and tagged basil, chevre, margarita pizza, mozzarella, sun-dried tomatoes, tomatoes. Bookmark the permalink.